Vijay is a partner in the firm’s market-leading Corporate Dispute Resolution Group with specialist expertise and deep industry knowledge in telecommunications and technology based disputes. After over 15 years of active practice in this field, he possesses an in-depth expertise and understanding of the commercial and technological aspects of the telecommunications industry which he leverages for the benefit of his clients. His forward thinking, proactive and driven approach allows him to consistently secure a successful outcome for his clients at all levels of the courts and also in arbitrations. Vijay’s telecommunications and technology practice expertise and experience covers an extensive range of high value disputes including – software development, network service provision, cloud computing and data center management, IT system integration, network infrastructure, hardware agreements and outsourcing. Vijay also maintains an active corporate and commercial disputes practice which primarily focuses on shareholder disputes, directors’ duties and liability, negligence and corporate fraud. Vijay’s insurance practice covers all classes of insurance and reinsurance. Over the years, he has successfully advised and acted for numerous major life and general insurers and reinsurers locally and abroad. 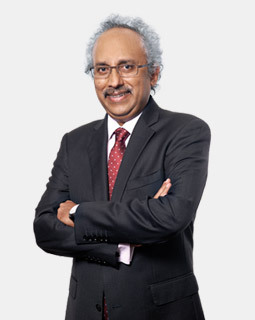 Vijay is ranked as a “Leading Lawyer” in Dispute Resolution & Litigation by Asialaw in their inaugural listing of top lawyers in Malaysia. Vijay is also listed in the Legal 500 Asia Pacific 2019 ranking as a “Leading Lawyer” in the Telecommunications, Media and Technology space. Successfully defended a major public listed telecommunications company in arbitration proceedings at the Kuala Lumpur Regional Centre for Arbitration. The claim was valued at over RM1 billion and involved a contractual dispute arising out of a Partnership Agreement between the client and the claimant to offer VSAT Ku-Band telecommunication services. Allegations of breach of commitment, breach of confidence and breach of an exclusivity provision were amongst the complex issues raised in proceedings. The favourable award by the arbitral tribunal was an overwhelming victory for the client. Successfully defended a leading public listed telecommunications company in a RM30 million claim for misrepresentation, negligent misstatement, conspiracy and unjust enrichment. The numerous complex issues were dismissed in totality and substantial costs were awarded in our client’s favour. Instructed to represent a prominent telecommunications company to resist an application to set aside a complex multi-million dollar arbitral award pursuant to Sections 37 & 42 of the Arbitration Act 2005. Successfully acted for a leading German manufacturer of metering and mixing technology with a presence in over 30 countries worldwide. In the first case of its kind, the court granted an unprecedented post judgment Mareva injunction to freeze the assets of fraudulent directors and officers of the client’s local subsidiary to allow for the enforcement of the High Court’s award of damages made in the client’s favour. Instructed to act for a leading insurance company listed on the Korean Stock Exchange to recover insurance claims of USD$100 million from a Labuan based reinsurer. The claim was vigorously resisted. After a long battle in the trial and appellate courts, we successfully obtained a favourable settlement for the client. The reinsurer’s application for a Fortuna injunction in the High Court was successfully resisted and a settlement agreement was entered between both parties. Various issues of law were involved, including the application of laws of different jurisdictions. Successfully defended one of the top property developers in Malaysia listed on Bursa Malaysia. The dispute involved a novel question of law in regard to whether the prescribed form of the Sale and Purchase Agreement in the Housing Development Act 1966 may be amended or varied by the developer, and what, if any, consequences followed therefrom. Instructed to act for one of the largest Malaysian telecommunications company to defend an arbitration claim valued in excess of RM30 million involving a state government. The myriad of allegations also include procurement of breach of contract, unlawful interference of business, conspiracy and breach of confidence. Instructed to advise a leading integrated telecommunications company since 2003 with their day-to-day legal issues and disputes. The complex and technical nature of the client’s business demanded, amongst other things, the understanding and development of seamless solutions to cater to the client’s needs. Instructed to advise and assist a leading multinational brewery group on a retention basis as well as to represent them in legal suits against their local dealers and vendors. The seamless service provided is highly valued by the in-house team and has resulted in us becoming the single point of contact for all the client’s legal needs. Instructed to act for a major telecommunication company in a multi-million dollar claim against a Government controlled infrastructure developer for the Mass Rapid Transit (MRT) Project. The claim involved losses suffered by the client as a result of damage caused to their underground telecommunication cables. Successfully acted as lead counsel for a major general insurer in proceedings arising from a professional negligence liability policy involving one of the largest banking groups in Malaysia. The case, which had a claim value of more than RM10 million, included issues touching on policy wording, policy liability and the insured’s duty of disclosure. Acted for a large local life insurance company on a wide spectrum of contentious matters including insurance contractual claims, disputes with the agency force and property matters. Acted as lead counsel in the defence of a leading Labuan reinsurance brokerage firm in a claim brought by an insurance brokerage firm based in the Philippines. The issues were varied and complex, including duties owed by placing brokers and the effects of pre-contract representations in dealings between brokers.